In any event, I didn’t get the name of the band, but I got the name of the song: “Pop Cliche.” So of course, the next time I got anywhere near a computer, I tried to google, but nothing came up, since Google wouldn’t exist for another 15 years. So I figured that I would never ever hear this now mysterious “Pop Cliche” song ever again: that it would a mythological song in my life, always remembered but forever unheard. And eventually, unremembered, as well. 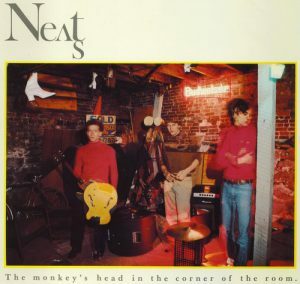 Not so much: fast-forward to November 1983, and self-titled debut by Boston’s The Neats had made it to KFSR. With its strummy guitars, trashy organ and steady beats, it was a record that I really loved, but because it was on an indie label — Ace of Hearts records — it was also nowhere to be found at Tower. So I was super excited that during the obligatory L.A. record shopping stop our our way home from the I.B.S. Convention — a college radio gathering that Tim, Kirk & I were lucky enough to somehow go to — I found not just The Neats, but an earlier EP called The Monkey’s Head in The Corner of The Room. And lo and behold, the final song on that EP was “Pop Cliche.” Score!!! Of course the song “Pop Cliche” is what indie guys from the early 80s ideas of what a Pop Cliche is: swelling guitars, backbeat drums and chord changes that are as familiar as the pub you go to watch a local band play rock standards. It’s kinda beautiful and kinda melancholy, and there is just a hint of menace in the early builds, but the back half is all release, as the cliches pile on top of each other until the end.